Whether you have a large medical practice or are a single practioner, cash flow is negatively affected by slow-paying patients and unresolved insurance claims. With Transworld Systems Accelerator, your accounts are worked earlier and this allows your payments to be received faster increasing your cash flow! Early intervention is the key to successful collections!! 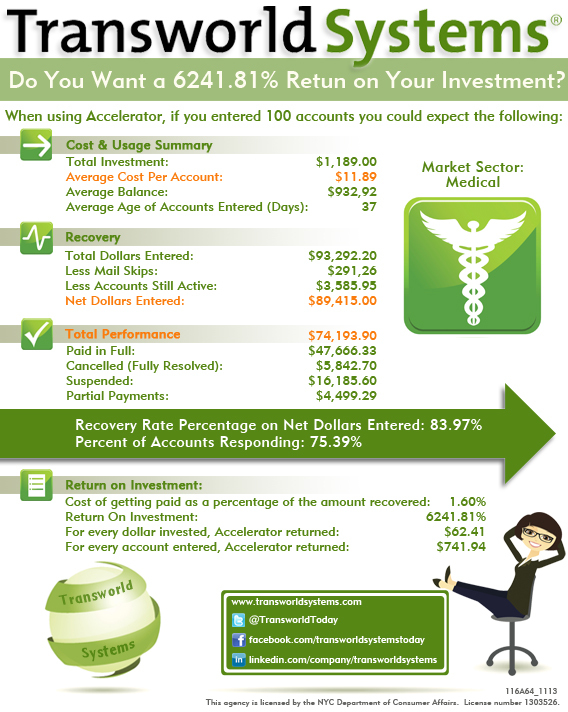 Review the infographic below and see what kind of return on your investment you could make when submitting just 100 accounts to Transworld Systems! Is it worth a 20 minute conversation to see how you can get a 6241.81% return on your investment, while decreasing staff time, frustrations and expense at the same time. Contact me through the contact link below, or call me at 888-780-1333 for more information or a no-obligation demo of our services.